Thank you to Olivia Dillon who came in to take our school on a nature walk in the Burren National Park. The children learned about three different flowers, The Spring Gentian, Bird’s Foot Trefoil and The Orchid. The children have being learning all about dairy products and how important they are for you. The children learned how butter was made in churns years ago and how now it is much easier using new machinery. The class then got the chance to churn their own butter using cream and a jar. The children had lots of fun and loved tasting their own homemade butter on crackers afterwards. The Junior Room have been learning all about Polar Bears- their habitat, appearance and diet. The children loved learning about the Polar bear and really enjoyed making their own Polar Bear masks. The children at Boston would like to thank Sean for coming in to show them some stuffed animals, the Red Squirrel, an Otter, a horses head, bats, a beaver, a pine marten, a stoat and a hedgehog. The children had been learning all about the Red Squirrel and hedgehog earlier in the year and thoroughly enjoyed getting to observe and explore these animals as well as learning about many more. The children have been learning all about Hedgehogs. The senior infants wrote reports about the hedgehog and the whole class made hedgehogs for art. The children are very busy carrying out experiments such as sinking and floating and static electricity. The senior room are working together in groups and individually to test different theories and carry out their own experiments i.e. finding out what happens when you mix oil and water, how different materials soak up water, making popcorn, volcanoes and much much more. 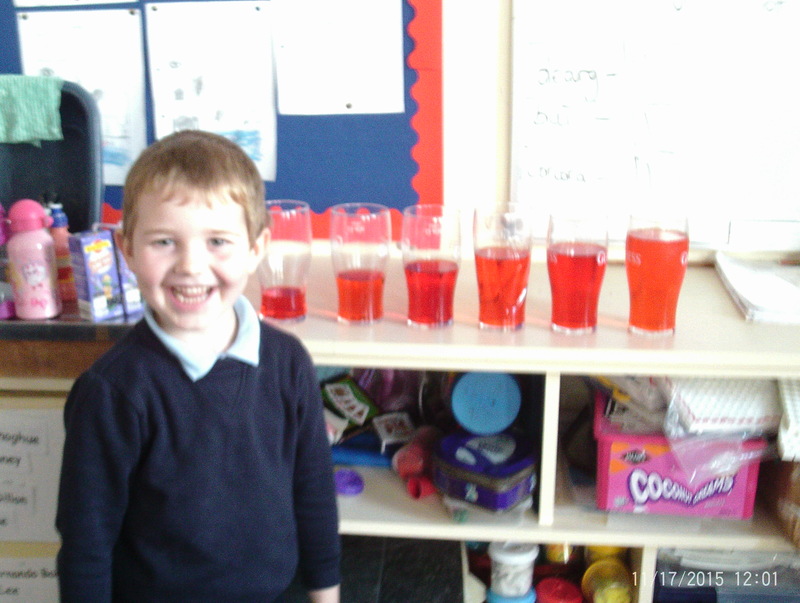 The children are really enjoying science week and are learning a lot from one another. This week the whole school planted crocuses in remembrance of those who died in the Holocaust during WW11. The children in the Senior Room got the chance to present their projects today. The projects were based around places in Ireland and they all worked really hard and produced great projects in the end. The Junior Room are having lots of fun learning all about the Red Squirrel and exploring the season of Autumn. The senior room have done lots of projects since they came back to school in September. They have learned all about Co.Clare, the sparrow, the badger and the kestrel. The children have learned lots and really enjoying looking up information and putting it together to make their very own projects. All children get the chance to present their projects and they are then displayed on the walls of Boston N.S. The Junior Room have been busy discussing the topic ‘This is Me’ and exploring through pictures and timelines how they have grown and changed since they were babies. The children have also been sorting toys into old and new categories and exploring how these too have changed over time. The children had a show and tell Friday where they got to bring in their favourite toy and describe it to the classroom. 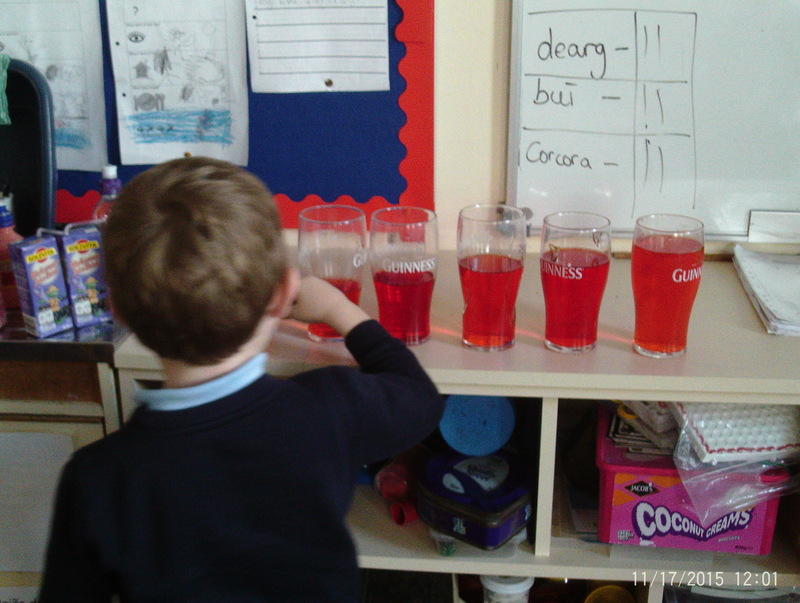 The children loved this and had great time showing their toys to their classmates. The children really enjoyed taking part in the Marine Education Programme. Each child received a certificate for taking part and working really hard. 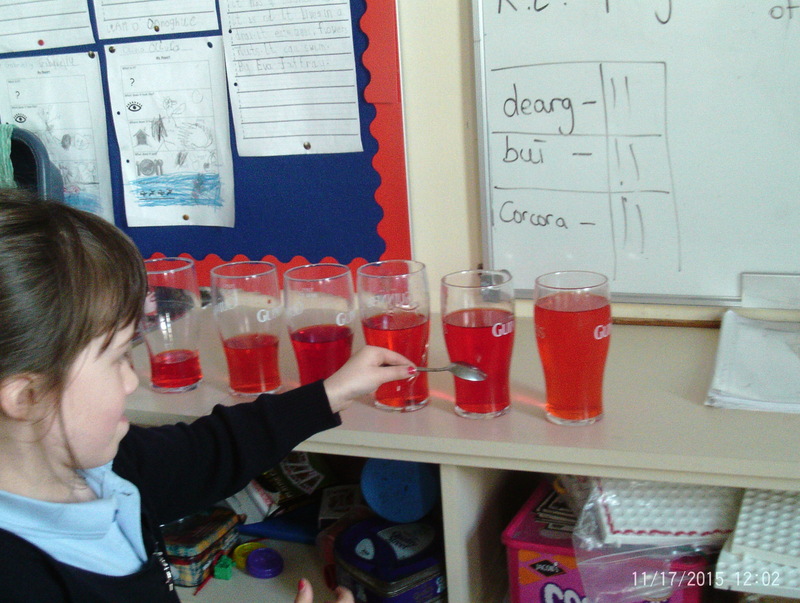 Nòrìne from the Programme came to visit our school and carried out experiments on how to filter and clean dirty water. The children loved this and got to explore with different materials as well as realising the importance of looking after our seas and oceans. Boston N.S. have been working really hard to try and receive the Blue Star Flag. They are learning all about the European Parliament and member countries of the EU. This week the children had a very special guest speaker Sean Kelly MEP and former president of the GAA. Sean spoke to the children about the EU and how important it is in our lives. The children performed a mini mock court for Sean, debating whether Ireland should stay or leave the EU. Majority ruled and the children decided it was in Ireland’s best interest to remain in the EU. The children also brought in lots of foods from the different EU countries such as pizza, pasta, chocolate, cheese, bagels and much more. The children have also completed lots of projects and books representing all the different cultures, fashion and sport around the EU. The children and community all came together on Tuesday March 15th to raise the Irish Flag and celebrate the 100 year anniversary of the Easter 1916 Rising. A great evening was had. The children got the chance to show their 1916 projects where they explored life during the 19c Irealand. Well done to First and Second Class who won a prize for their 1916 Easter Rising project. The children made a video in which they talked about like during 1916 Ireland. They spoke about Dressmakers, Blacksmiths, how flour and butter was made and light in the past. They won a trophy for the school and prize money to but the book of their choice. Congratulations First and Second Class. The whole school were very lucky to get to go to the Clare Education Centre to take part in the ‘Explorers Education Programme’. The children learned about our oceans and the animals one might find in them i.e. sharks, dolphins, star fish, lobsters and squid along with a lot more. The children also learned to appreciate the importance of the oceans in our lives i.e. shipping, giving us oxygen from the plant plankton, homes for animals and much more. At the end of the talk the children got to dissect a squid and explore lots of artefact remains of some of the unique animals we can find in our oceans. This week the children had a visit from the Irish Army in preparation for the hundred year anniversary of the 1916 Easter Rising. The children were presented with a copy of the proclamation and Irish flag. The children played Amhrán na bhFiann and one of the students helped read the Proclamation. The whole school have begun their efforts to receive the Blue Flag for their school. The children will be learning all about the European Union and the Countries that are part of it. This week the children talked about EU countries they have visited and together we pinned these on our EU map. 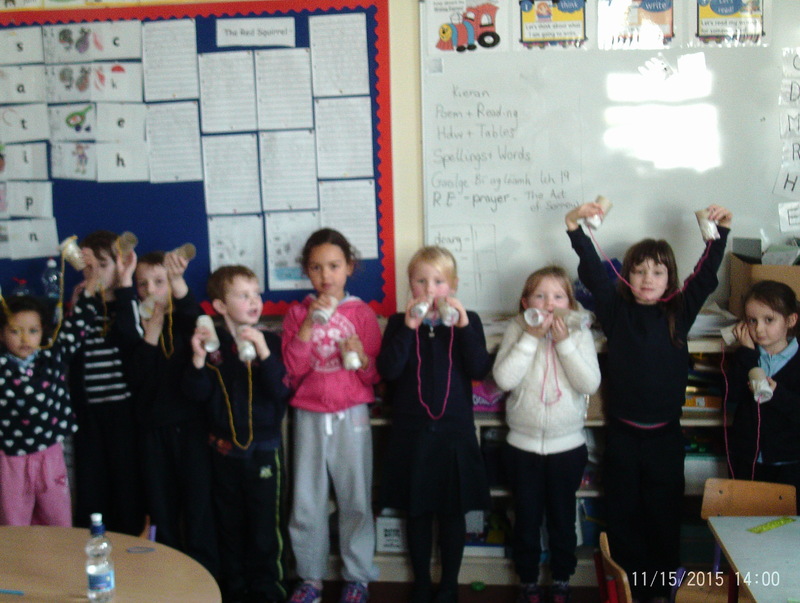 The senior room explored sound this week and got the chance to reuse materials to make a range of musical instruments. The girls and boys in Ms. Bennett’s Class were busy this week drawing what school life was like around the time of the 1916 rising. They got to discuss how things have changed since then focusing on the school games played and school materials which they did not have back then such as IWB and so on. During Science week the Junior room explored sound and carried out experiments making music using different amounts of water in glasses as well as making string phones. The Senior room learned about materials and their properties. 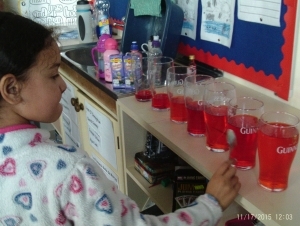 They investigated what happened when you mix acids and bases and when you mix oil and water. 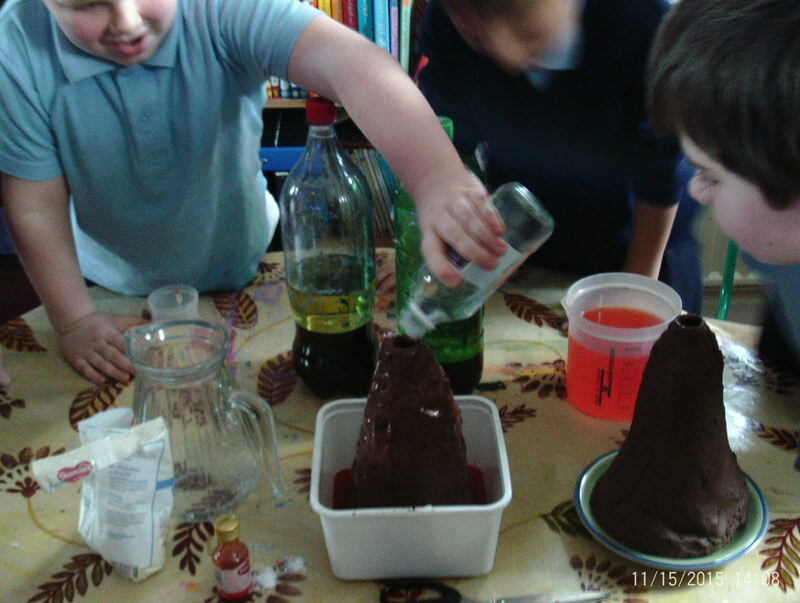 The children explored these through making mini volcanoes and lava lamps. We celebrated Tree Day on October 8th by planting a Hazel trees in milk cartons. We also planted crocuses in remembrance of those who died in the Holocaust. The Junior room discussed their homes, homes in other countries and also what they saw on their journey to school. The Senior room were learning about different counties in Geography. The Senior room made their own powerpoint presentations in History. They created powerpoints on Setanta and the Celts. The senior room made their own personal timelines. The senior room are learning about their local area. They painted some pictures of what they see in the local area.